This is probably my favorite image from my very first engagement session with my first couple Anthony and Vicki. My very first engagement session in Gainesville, Fl. This week I embarked on a new form of photography for me, which is engagement photography. This is kind of like wedding photography except almost every shot is set up and posed insted of being captured in a journalistic fashion. I shot some pictures with my friend Anthony and his fiance Viki who are getting married in about a month. We set up at the historic Thomas Center in Gainesville, Fla., which is quite a beautiful location. Inother words if you shoot weddings or engagement photos in Gainesville you will probablly end up shooting their. While I was shooting I did see another photographer walking around taking pictures. The Thomas Center is a great location because it is also just such a big place, their are alot of locations on their grounds that are perfict for this type of shoot. It has a large fountain that showcases the building in the background, two court yards, some nice archways and stairways, nice trees and just beautiful architecture. We just walked around the grounds of the Thomas Center and took pictures. We even found a dialectic couch that some one had set out on the curb across the street that we were able to utilize in the shoot. This was a tough shoot for me because the only time that Anthony and Viki could get toghter with me was right at noon, the absolute worst time of day to shoot pictures because the lighting is so harsh. I was able to get around this by utalizing the open shade under the large oak trees that line the property and using my off camera flash to give a bit of subtractive lighting to my subjects. It was tough though because even at full power my flash could bairly compete with the sunlight to shead the right amount of light on the faces of my subjects. It was also difficult to shoot with a large aperture, because to use a flash you have to have a shutter speed of anything under 1/200th of a second. With it being such a bright day, even with the ISO as low as it would go I was not always able to utilize the shallow depth of field that my lenses are capable of, so I did a lot of shooting at f8. This was also my first experience trying to shoot engagement photos, so I was a bit nervous even though I was doing this for free for them to build my portfolio. I think that over all the photos turned out pretty well given the shooting conditions and the fact that I have never shot in this manner before. Through this experience I have found that some times it works to just wing-it and just try to have fun with your subjects, because I was able to capture some great moments with them. I have a feeling that I will be doing a few more of these types of shoots in the future. Here is a gallery to the painting with light photos that I took for my lighting class at the University of Florida while studying photo journalism. This week I dabbled in painting with light, where you make a long exposure with your shutter and “paint” your subject with light. So far This has been my favorite shoot that I have done this semester for my photojournalism class. I actually did two shoots for this assignment, the first with Norma as my model and the second with Maggie as my model. Both went very well and I got some pretty cool exposures with each. My techniques that I used for this shoot were quite simple. I set my camera on a tripod with a timed exposure of 30 seconds, to give me enough time to run through the frame and “paint” my subjects with light. Then I litmy subjects using multiple light sources, mainly my LED mountain bike light with different objects used as filters, until I broke that light and had to switch to a different light. For the filters I used a pink c.d. case, an amber medicine bottle, a green nutcracker Christmas ornament and a blue sheet of plastic. I would hold these over my light source to achieve different colored light in the frame. 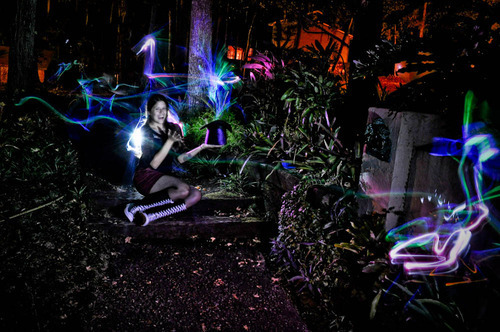 For the “magical” looking mist in some of the pictures, I use multiple colored glow sticks and just waved them around in the picture. I would also use a small LED light to draw in some of the photos. I also had my camera set with a very small aperture of f14 for most of my shots. The reason that I did this was to get a very large depth of field, because shooting outside with no ambient light, it is very hard for the camera to focus on the subject. A large depth of field just allows everything in the frame to be sharp and in focus, no matter how far from the focal point an object is. I also set my ISO around ISO 800, as a result of shooting with an aperture of f14. Ideally you want your ISO as low as you can get it, preferably around ISO 100 to reduce noise in your photos. Because I was using such a long exposure and lighting my subjects with a portable hand held light source, this gave me freedom to do some really creative things with these photos, that you cant do with a fast shutter speed. I was able to duplicate people in my photos, by illuminating them in one spot for a few second and then having them move to another position and illuminating them again. I was also able to draw or pint objects in to my pictures, such as the stick figure holding Maggie’s hand in a few of my pictures. The hardest part of this shoot was keeping my subjects still for 15 to 30 seconds at a time. If they moved, the image would blur and I would not get a good exposure. This was also my most time consuming shoot of the year. I think think that I spent three hours shooting Norma and five hours shooting Maggie, but the results speak for them selves in my opinion. Ok, after using the Sigma 70-200mm APO EX DG Macro lens for the last several days here are some photos taken with my Nikon D90 for you to analyze. My first impressions after using this lens for a few days are good so far. The image quality is excellent and having an f2.8 aperture is wonderful. The 70-200mm focal length is wonderful for portrait photography as the longer focal length of this lens gives a very flattering look due to the compression of the image. Overall I am very happy with this lens and I highly recommend it to anyone who is considering purchasing a telephoto zoom lens. I have been shooting with this Sigma 70-200mm f2.8 lens for a few days now and I have found it to be pretty good. It’s has a sharp and fast auto-focus, not quite as fast as the auto focus that you would find on the Nikon lens. But, at being a third the price of the Nikon, I think that I can live with it. This lens uses what Sigma calls its Hypersonic Motor or HSM focusing motor, meaning that this lens can be used on more entry-level cameras, such as the nikon d3000 and d5000. The focusing and zooming is all internal on this particular lens, so there is no optical element moving on the outside when you zoom in and out, or focus. The lens stays one length though out the full zoom range. This lens also allows the user to manually override the auto-focus, allowing you to really fine tune the focus, or correct for the occasional back focus problem. I didn’t have too many issues with this lens back focusing. The only issue that I did have however, was when I was trying to focus on a very small object such as one flower in a large bed. The lens kept focusing on the larger bush behind the flower. This was no problem because I was simply able to correct the focus with the manual override feature that this lens provides. The optical quality of this lens is very high, I would say it is to be expected though, with a price tag of around $800. The lens appears to be pretty sharp through out its full zoom range. I would say that as you near the 200 mm end, the image does become slightly softer, but not too much to where it is very noticeable. I didn’t notice any vignetting in the photos that I have taken so far with this lens. I did however notice that at the long range of the zoom, closer to the 200 mm mark, there is a very slight amount of chromatic aberration, though it is not really noticeable. Thanks to the large lens hood and the inclusion of Sigma’s Super Mulit-Layer lens coating, this lens does not really have any problems with lens flare or ghosting. One feature that I think is quite good on this lens is its “Macro” feature, which is in this case more of a close focus feature. I have to say that I am quite impressed with this, lens’s ability to focus on a object that is about 30 inches away from it with surprising clarity and sharpness. Though, not as sharp as what you would see is a true macro lens. Thanks to this lenses large aperture of f2.8, you can really shoot in some real low-light situations, while keeping your shutter speed up to freeze all of the action and to avoid any camera shake. Having such a large aperture also allows the user to really blow the background out of focus giving the picture a nice bokeh (the out of focus background area in a photograph). Because this lens has a constant aperture of f2.8 through out its entire zoom range, you don’t run into the same problems that you experience with a lesser quality lens with a floating aperture, where your exposure is constantly changing when you zoom in and out. I would definitely recommend this lens to any photographer. This lens is not quite as sharp as the Nikon, though image quality is still exceptional. I think that it preforms exceptionally for being one-third the price of the Nikon. Though I have not used the Nikon 70-300 mm “prosumer” lens, I would strongly recommend spending the extra money on this Sigma. You’re getting better image quality and faster glass, which in my opinion, is more important than having a longer reach lens. Anyways, on a Dx format camera such as the Nikon d3000,d5000, d90 or d300 you get a zoom range that is 105-300 mm. One issue that I wish that Sigma would address with this lens, is giving it proper weather sealing, but that is the only a slight complaint with this lens. Over all I think that this is a great lens and an exceptional value when you compare it to the Nikon 70-200 f2.8 which goes for about $2,400. I just got this lens today. The UPS guy dropped off this package this morning and I decided that I would do a video unboxing of this lens. It is the Sigma 70-200 mm f2.8 apo ex dg macro with a HSM (Hyper Sonic Motor) focusing motor. I’m going to throw this big boy on my camera and take some test shots over the next couple of days, then do a full review of this lens. Welcome to my photo blog, what am I going to do? Welcome to my photo blog. My name is Chris Watkins, I am a photojournalism major at the University of Florida in Gainesville. Thats right, I go to the same school that Tim Tebow attended. Aside for that I am also a musician and an avid cyclist, both mountain and road. You can probably expect to see quite a few photos from concerts and bicycling events. In this blog I am going to be reviewing camera gear, analyzing photos that I have taken, how I took them, what my camera settings were, which lens I used to capture the photo and where I was when I took the photo. I will also be posting YouTube video reviews along side with my text reviews of equipment most of the time. I will also describe what I did to the photo when I edited It. I.e. what I did in Photoshop or in Lightroom. I don’t anticipate doing much editing to my photos aside form cropping them and adjusting the color balance, so don’t expect to see many if any HDR photos in this blog. HDR has no place in journalism. I am also going to set up a Flickr account to post my best shots, so that they can bee seen in a larger format than is available on Tumblr. I hope to update my Flickr about once a week to keep it current with what I am shooting. Once I finish setting up my Flickr account I will post a link to it on this blog. Another ting that I might do is choose a “photo of the week” and give my thoughts on the picture. I’m not really sure that I will be doing this, so don’t expect to see this right off hand in this blog. I mean, I will be doing probably a “photo of the week” photo that one that I shot and critiquing that. I’ll choose my best photo that I took during the week and show it off, but I don’t know about reviewing other peoples photos. Don’t really expect me to follow through with all of the things that I say I will do on this blog.